What is the start to YOUR Holidays? As my time here teaches me, the true value of the Italian culture is in the way they do not see tradition as a shackle but rather as a way of life; A point of differentiation that needs to be proudly maintained and taken joy of. From amazing cheeses to generations old balsamic vinegar to all the cured meats, the magical food history of this land is rich and bountiful. And, unlike the American mentality to hoard and pile richness on richness, the Italians elegantly approach each ingredient with the respect warranted for it all by itself. And, they indeed pair, it is not to be over-the-top but to be subtle complement of flavors that leave your floored with they deceptive simplicity! 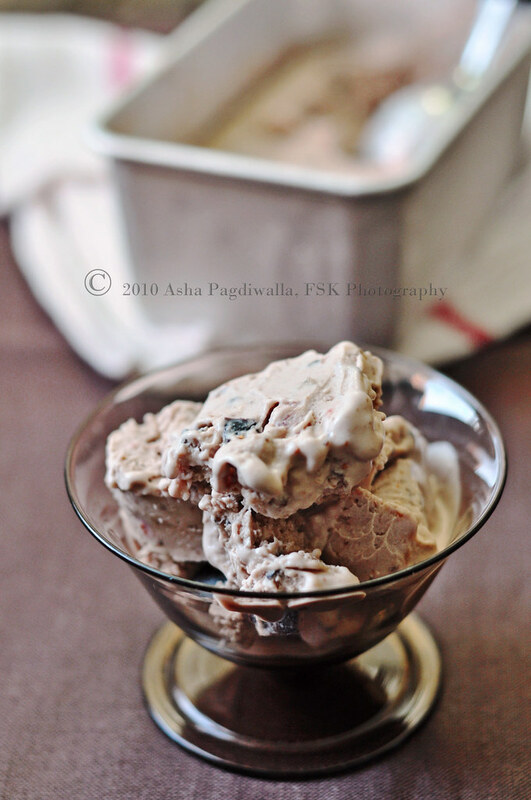 Anjeer ice cream is usually made with just fresh figs. But, I wanted to put a twist. Well, the inspiration was from, believe it or not, a frozen custard from Shake Shack. Based on that taste, from about a year or so back, I made a Fig and Balsamic Ice Cream. 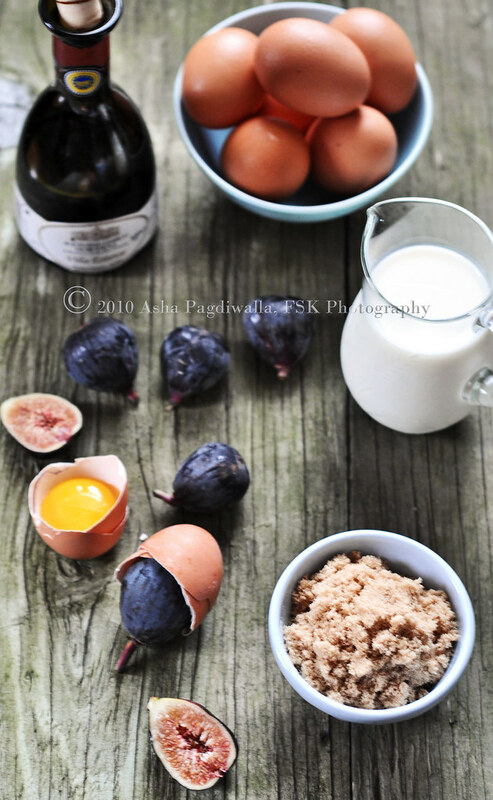 The base for this ice cream, from which all the flavor is derived, is very simply from figs poached in balsamic. Usually I use dried figs for poaching since it is more commonly available. The rehydration of the figs in the reducing balsamic adds such an oomph of flavor. The sharpness of the vinegar is cut by the sweetness of dried figs. 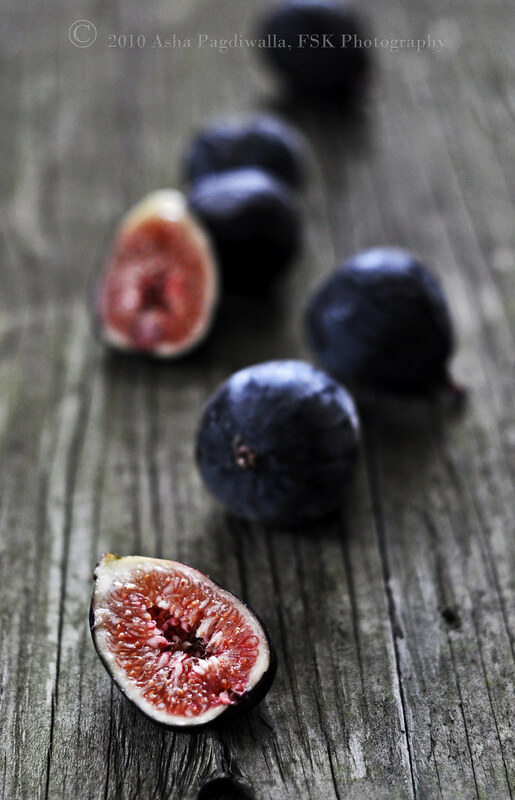 I was contemplating ice cream flavors, while I grocery shopped, and I spied a gorgeous basket of figs at the fruit vendor. Immediately, my brain wired a snapshot of my hub's glee (at tasting his favorite anjeer) to my fore brain and I was sold in half by that vision and in half by the lusciousness in front of me. Back home, I thought I would experiment poaching fresh figs for a change. I was actually a bit anxious that the fresh figs may not have enough sugar to compensate for the pungent vinegar but they actually caramelised exquisitely! Oh yes, you are wondering where the review part is. Remember, I mentioned a CSN stores review and about getting an Ice Cream maker? Well.. two birds and all that. I used this Cuisinart machine to make this ice cream. First attempt on the machine was good but not great. I am not sure what happened. Perhaps I should have added the fig chunks after the machine run? The issue I had was that the volume didn't build after churning, which, btw happened only for 5 minutes. Well.. I'll update on that after my next attempt (without chunks)! By hand, cream the yolks and sugar together until light yellow in color. Meanwhile, heat the half and half until just barely simmering. Remove the pan from heat. Slowly, and while continuously whisking the mixture, incorporate the hot milk into the yolk mixture. To prepare the custard, pour the mixture back in to the pan and over medium heat, gently heat the mixture, stirring often. The mixture will start to thicken. Continue heating until the mixture coats the back of a wooden spoon (about 8 - 10 minutes) and if you run your finger along the back of the spoon, the streak remains without the cream running down through the streak. Remove from heat immediately. Do not over heat as the eggs will curdle (done that before!). Whisk the mixture for a minute to stop the custard from cooking further. Strain through a fine sieve to remove any lumps or scrambles. Stir in the fig mixture in whisk to incorporate fully without lumps. Cool the mixture to room temperature. Cover the custard with plastic wrap and refrigerate for atleast two hours until completely chilled. At this point, you can process the mixture in an ice cream machine according to manufacturer's instructions. If you don't have an ice cream machine, once the custard mixture is cold, move it to the freezer. After about 45 minutes, check on the mixture. If it has started freezing on the edges, remove and whip up the mixture with a hand-held mixer to break the ice crystals and incorporate some air to create the fluffiness. Return to the freezer and repeat the whisking every hour, three more times. By this time, volume of the ice cream would have doubled. If it hasn't, then you are not whisking enough each time. After the final repetition, gently fold in the reserved peach chunks and freeze the mixture for atleast 6 hours or overnight. In a heavy bottomed pan, arrange the figs. Add enough vinegar to completely cover the figs. Add honey. Bring to a boil and then simmer on low until the figs have shrunk and the vinegar has thickened and reduced to a third. Cool to room temperature and grind to a paste. 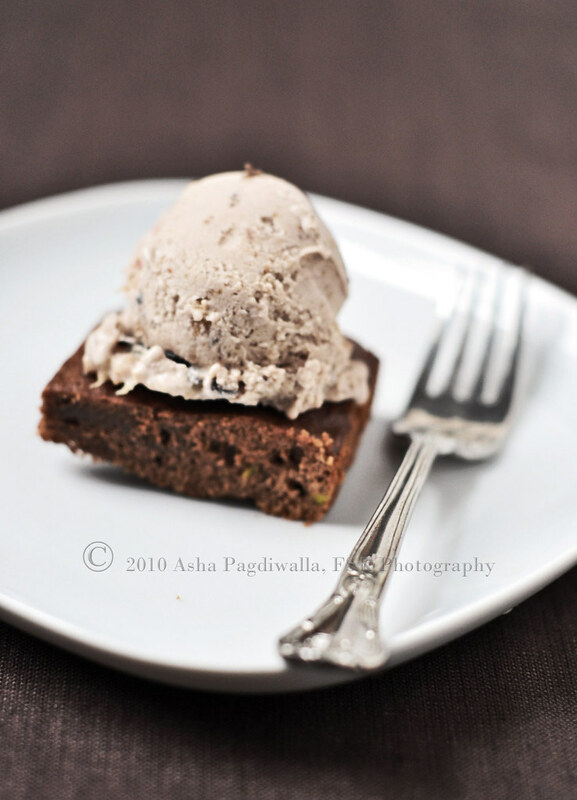 This recipe makes more than needed to the ice cream above. 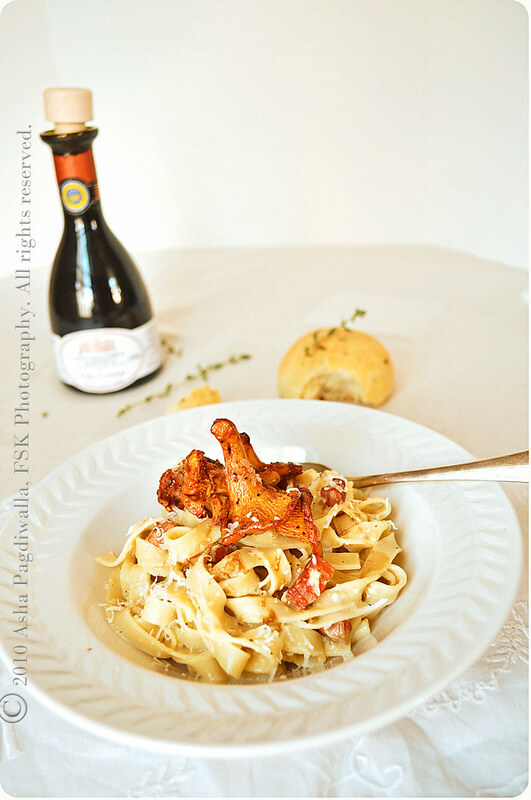 The rest make a fantastic spread over toast or with prosciutto! 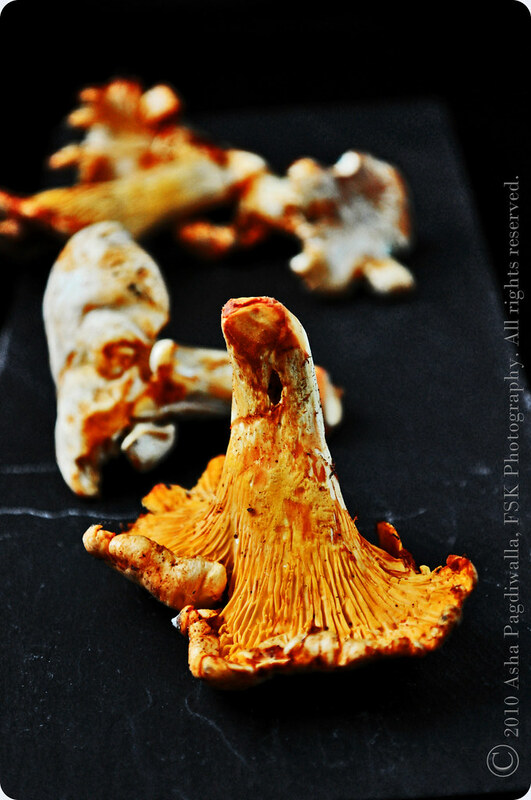 Here, I'll say it; I love Chanterelles!! From the name, which, is such a melody, don't you think? ; to the color, the rich sunset hue! ; to their flavor, meaty yet oh so, delicate! I have been in love with them for a while now and when I saw their stupendous beauty laid out for all to see by Danielle, Spring just couldn't come soon enough for me. Even when it had warmed up considerably enough for me to be hopeful of finding this bounty in grocery stores, I couldn't! My neighborhood stores didn't have any! Every week, I scrounged and came back empty, limping in disappointment. Even the Union Square markets, known for their variety fell short. 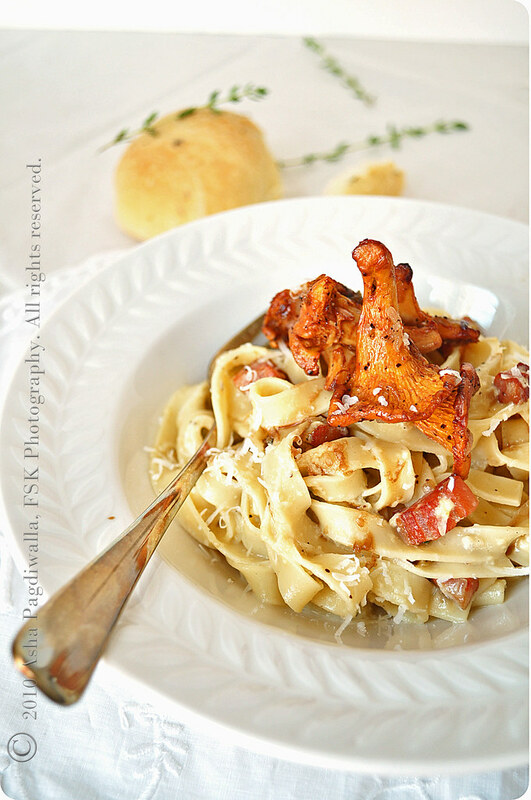 You could just as easily eat these Sauteed Mushrooms over toast but I had also picked up fresh pasta along with the mushrooms and had been itching to try Carbonara Sauce for a while. They just seemed to go together. So, although, the mushrooms were prepared minimalistically, the whole dish with the pasta was satisfyingly rich in flavor and texture. Since this is a such a simple dish to put together, I am not putting down a recipe per se. 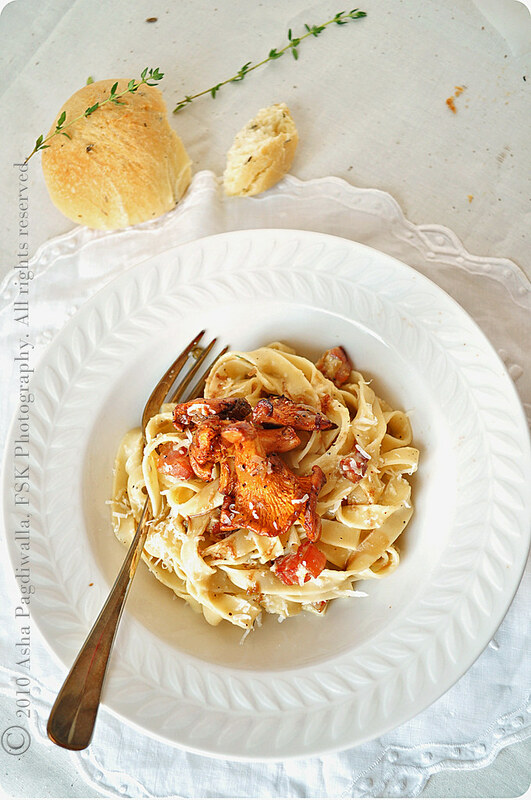 For the pasta, I used a standard carbonara recipe with pancetta instead of bacon. For the mushrooms, saute some sweet onions in butter until translucent. Add the mushrooms and season with salt and pepper (go light on the pepper) and cook just until the water has been released from the mushrooms. 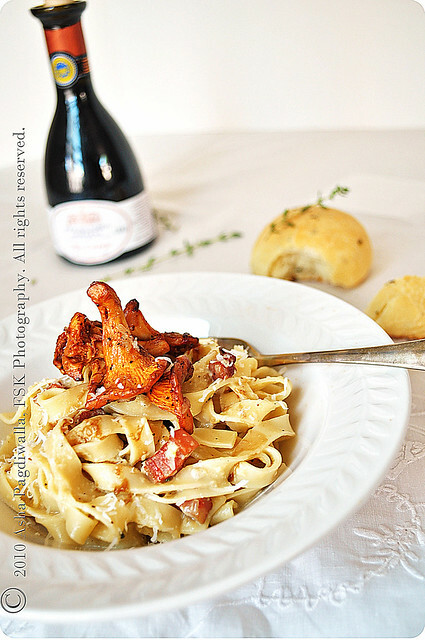 Top the pasta with the mushrooms, drizzle some balsamic vinegar over, serve immediately and take a trip to Nirvana!